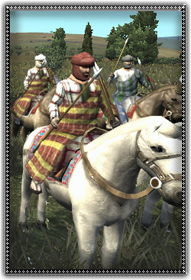 These are the Sheikh’s own troops, drawn from the strength of the tribe. Mounted or unmounted, they fight in typical Arab fashion with the javelin and the straight-sword. Their javelins provide a deadly weapon to light and heavy troops respectively. They can pierce the heavy mail of warriors and if hurled well, can hit targets from a great distance, although they cannot go as far as a bow. If confronted, these javelins become close range weapons and the skirmisher becomes the warrior, but do not let these troops become heavily overrun.